'A MULTI-LAYERED BOOK ABOUT HOW OUR WORLD IS CHANGING AROUND US' - ReadPlus The old milk bar on the corner is coming down to make way for something new. Little Davey Durak is gathering scrap - a short piece of wood here, a long piece there. But what's Davey building? Bruce the bu... read full description below. 'A MULTI-LAYERED BOOK ABOUT HOW OUR WORLD IS CHANGING AROUND US' - ReadPlus The old milk bar on the corner is coming down to make way for something new. Little Davey Durak is gathering scrap - a short piece of wood here, a long piece there. But what's Davey building? Bruce the builder wants to know, but Davey won't tell ... Bestselling author Andrew Daddo and award-winning illustrator Stephen Michael King come together for the first time to bring you this very special picture book. MORE PRAISE 'Whatcha Building is a gentle tale of a little person with a big environmental message. There are many layers to unpack, explore and simply enjoy. Highly recommended across the Primary years.' MAGPIES 'a multi-layered book about how our world is changing around us ... There are many themes and ideas presented here that will initiate a variety of conversations and explorations, especially regarding how the world is changing, what is being lost and what we should try to hold on to.' 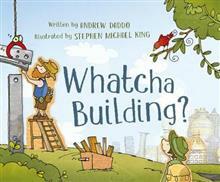 READPLUS 'A fantastic new offering from two remarkable talents' KIDS' BOOK REVIEW 'Whatcha Building? relays a wonderful message of community and awareness of recycling and sustainability. The text and illustrations are carefully considered whilst absolutely entertaining us at the same time. A down-to-earth book to share with dads; a reading experience that is sure to be recycled over and over.' BOOMERANG BOOKS 'loved the imaginative use of recycled materials in the illustrations, reflecting the preservation of community. This book provides avenues for conversation and reflection, and encourages children to respect their community and maintain its history.' READING TIME 'Young readers will have fun trying to predict what it is that Davey is building while others will relate to their neighbourhood slowly but surely changing as progress comes to town.' THE BOTTOM SHELF 'I love the illustrations in this story as they not only accompany the text but they add more depth to each page. Stephen Michael King has used recycled garbage, cardboard, pen and ink to create the illustrations and this combination brings life to the story.' EDUCATE. EMPOWER.